Ospreys can be found on every continent in the world except Antarctica. In flight, ospreys are recognized by their long, crooked wings as they soar overhead. Although ospreys are large birds with a wingspan of 5 1/2 feet (1.67 meters), they only weigh about 3 pounds (1.4 kg). From a distance, an osprey at rest may resemble the bald eagle (Haliaeetus leucocephalus). Closer examination will reveal that, unlike a bald eagle, the osprey has darkly barred wings and tail, black bill, and bluish-gray lower legs. The underside of ospreys' bodies and wings are white, and a dark cheek patch contrasts with the white head. Female ospreys are slightly larger than males and are occasionally distinguishable by a more distinct "necklace" of dark feathers on their upper breast. A breeding pair probably mates for life and returns to the same nest area each year. Both adults help to build the large stick nest about three to six feet (1–2 m) in diameter. The nest is situated near water, atop trees, posts, rock pinnacles, or even the ground. The nest bowls are lined with soft grasses. In mid-May the female lays two to four eggs which are incubated by both parents for five weeks. Newly hatched ospreys are covered with gray down and are helpless. Females closely guard their nestlings from the weather and predators while the male provides the family with food. At four to five weeks of age, the nestlings begin wing-flapping exercises and are ready to fly at seven to eight weeks of age (mid-August). Although almost fully grown when they leave the nest, young ospreys can be distinguished from their parents by buffy fringes on all of their back feathers. Ospreys have been known to live for 25 years. 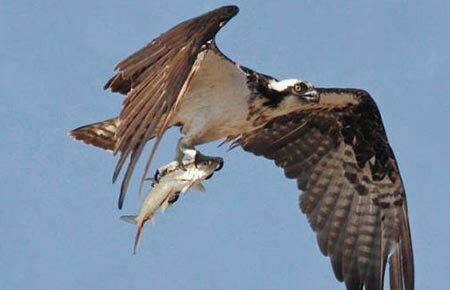 The osprey's diet is almost exclusively fish, a unique characteristic among raptors. They are opportunistic about the species of fish they catch, but they can only catch fish swimming within three feet (1 m) of the water's surface. They rarely take fish over 16 inches (40 cm) long. Ospreys occasionally capture small mammals, birds, amphibians, and reptiles. Anglers sometimes complain of ospreys competing with them for fish; however, an osprey needs only one 10-inch (25 cm) fish per day, so it is doubtful they have much impact on fish populations. Ospreys hunt while in flight, scanning under the water's surface for fish. When a fish is spotted, it will dive toward the water, and just before reaching the surface, swing its legs forward, plummeting its talons into the water. Fish are carried head first and then eaten back at the nest. Some osprey populations are migratory and spend their winters in Mexico and Central and South America. Most ospreys have departed Alaska by October and will return in late April. Ospreys can be found on every continent in the world except Antarctica. 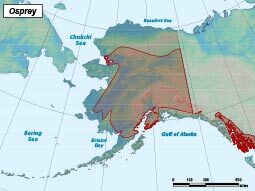 In Alaska, they range from the northwest, (base of Seward Peninsula) east to Canada and south to Southeast Alaska excluding the Aleutians, Kodiak Island, Alaska Peninsula, Seward Peninsula, and the Kenai. Concentrations occur in Hoholitna rivers, Northway-Tetlin area. They also breed in Southeast Alaska, Matanuska-Susitna Valley, along the Tanana River, and other river valleys in the interior. Ospreys prefer habitats with plenty of shallow water where fish are plentiful. They often built nests on small islands or structures over bodies of water that are difficult for predators to get to. Manmade structures such as power poles and other stable structures are common nesting sites. Little is known about the status of osprey populations in Alaska. Osprey frequently adapt to human activities, but any disturbances which keep adults from their nests in May or June may cause the eggs or young nestlings to become chilled and die. The osprey is adversely affected by stream or waterway alterations, specifically those which reduce fish populations or visibility in areas traditionally used as feeding areas. Osprey are highly susceptible to egg thinning by pesticide contamination. Osprey numbers declined severely in the 48 contiguous states when DDT was widely used in the 1960s, populations are recovering following the ban on DDT and other persistent pesticides. Northwest Alaska, (base of Seward Peninsula) east to Canada and south to Southeast Alaska excluding the Aleutians, Kodiak Island, Alaska Peninsula, Seward Peninsula, and the Kenai. Mainly fish, occasionally small mammals and reptiles. Bald eagles and great horned owls, as well as climbing animals prey on nestlings and eggs. Pairs mate annually, females lay 2–4 eggs December through March in non-migratory populations, and April through May in migratory populations.